Crazy Rastan! Always angering the gods! But is the fur cloth more comfortable than your standard loincloth? 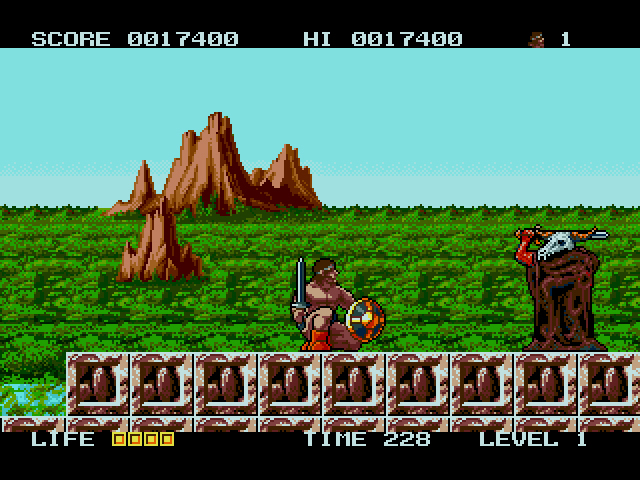 In Rastan Saga II, you play as Rastan, greasy barbarian-for-hire. Your mission: to pulverize a wide range of mythological creatures and restore order to a crumbling, forgotten world. The fantasy beat-em-up recalls two more popular (though not necessarily better) games, Golden Axe and Altered Beast, and the character Rastan is clearly a Conan ripoff. Still, there’s something enjoyably trashy about Rastan Saga II. It’s short, full of endearing Engrish, and like Altered Beast, doesn’t take itself too seriously. He’s holding that rope in the least manly way possible. Rastan begins his journey with a short sword and shield. With these, he can jab and block oncoming projectiles from any direction, including diagonally. He’s not limited to this combo, however. Enemies, once killed, will drop two other weapons, a long sword and iron claws that resemble Wolverine’s. The claws make for quick attacks, but you have to get in each enemy’s personal space to do any damage. Since most enemies either shoot projectiles or have swords themselves, the farther away you can attack them, the better. Enter the long sword, the best weapon in the game. It allows you to slice through evil at long distances and is more powerful than the other two weapons. Along with the aforementioned weapons, enemies leave behind an array of items. Various crests will enhance your sword with lightning or fireball power, slow down time, and eliminate every on-screen creature. Lights of Power restore your energy, and bizarre one-off items like the Fang of Hitler cause skeletons to form a dancing shield around you. Rastan kneels before his bleached master. Rastan needs every bit of help, because, well… look at him. How can he be anything other than a slow, lumbering strongman? Taito recognized this, which is why the game is methodically paced. With the exception of winged creatures like bats and harpies, enemies move as slow as Rastan; some even wait for you to approach them. This doesn’t make the game easy, though. Rastan’s enormous sprite often gets in the way of enemy attacks, and the sketchy hit detection means you’ll occasionally absorb attacks you didn’t see coming. Pretty sure you’ll see this superstar coming, though. The world of Rastan Saga II is vague fantasy. Generic forests, mountains, caves, and castles are used both as background environments and as settings for the levels themselves. The creature designs, however, are first-rate. Examples include the Gyganek, a hooded cow skull that reveals itself to be an enormous spider after it’s hit. The Water Shadow is a particularly frustrating demon that appears from dark pools of water to throw garbage at you. And the Muscle Snake is a beefy python that waits for you to get near it before it attacks. I don’t know who this creature is, but I, like Rastan, wanted to run when I first saw him. Rastan Saga II does not exist in its own beefy bubble. 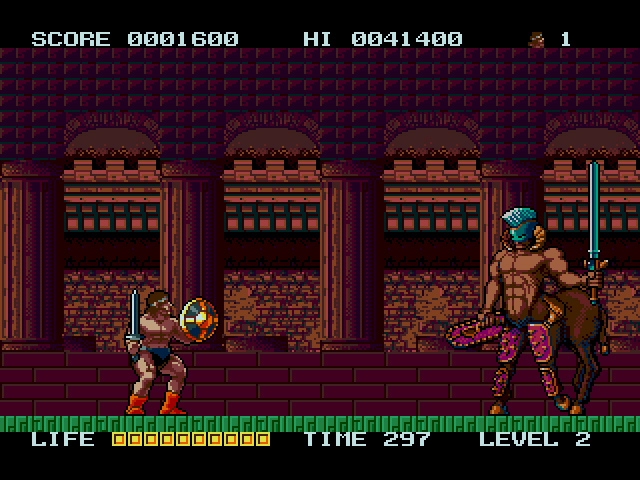 The original Rastan Saga was released for the arcades in Japan, but when it was ported to various computers/consoles (including the Master System) in the States and Europe, the game’s name was changed to Rastan. 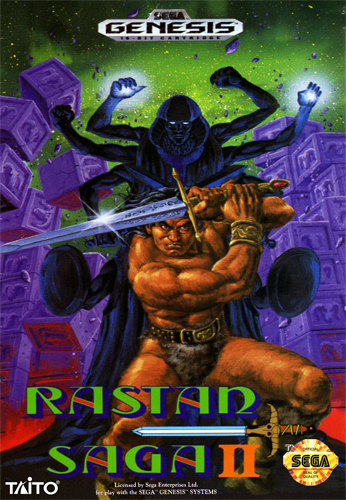 Rastan was never released for the Master System in Japan, but the Master System version was ported to the Game Gear in Japan only and re-titled back to Rastan Saga. 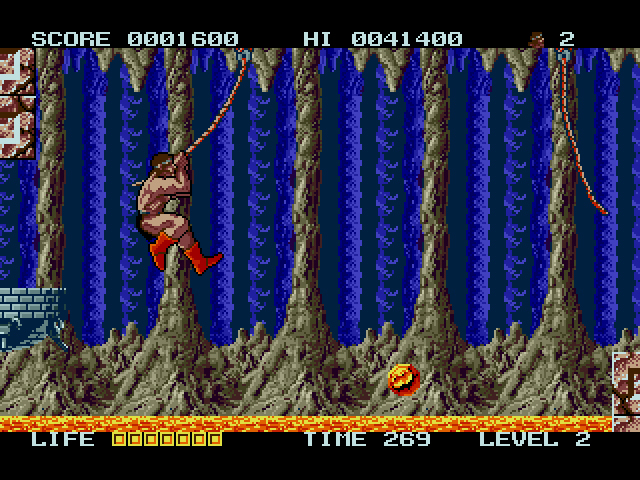 Rastan Saga II was re-titled Nastar for the European arcade release and Nastar Warrior for the American arcade release. 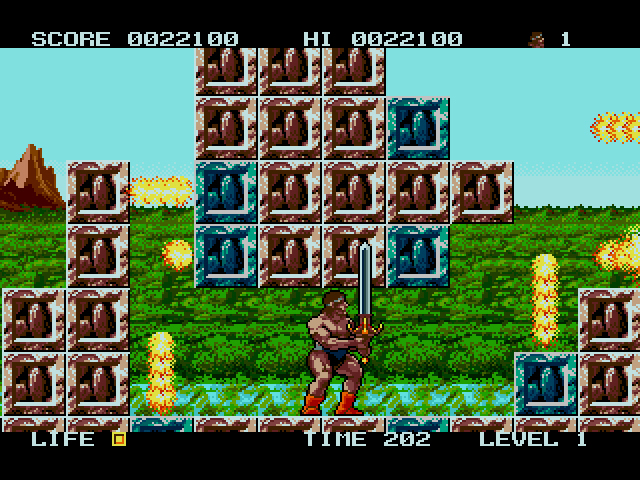 When brought to the Genesis in North America, however, Taito decided to keep Rastan Saga II as the name, despite any confusion this undoubtedly caused. Rastan Saga II‘s gameplay isn’t much different from 8-bit beat-em-ups of yore: enemies approach, you kill them, repeat until the final boss. This basic brawling approach surprisingly complements the B-movie atmosphere. The environments look like cheap movie sets that are about to fall apart. Rastan’s curious expression and nonsensical ranting in-between stages make for a gloriously cheesy protagonist. The developers clearly spent most of their time on the creative and occasionally horrifying creature designs, which are worthy of Harryhausen. As such, Rastan Saga II isn’t so much a good game, as it is – like all B-movies – an experience that deserves to be shared with friends. Good review – never played Rastan Saga II so I feel like I’ve missed out. Looks like it has that Altered Beast ‘so bad it’s good’ gameplay. I really enjoyed MS Rastan – is it better than that? Thanks GH! I think it’s better – or at least more entertaining – than MS Rastan, but I’m not sure that’s the common view. I petty much thought this game was horrible. I much preferred original Rastan. So much that I never stopped to enjoy the spritework. This game just seemed blocky and ugly to me. I’m really unsure why I never owned this one, this is definitely the type of game I was drawn to when I first got my Genesis. I did play the arcade game once. Also, because the arcade game was called Nastar Warrior, I was convinced that Taito took an unrelated game and made it into a Raston sequel for the console release (I do know now that I was wrong). We had Rastan for the SMS, which was a popular game for both my brother and I due to our love of Conan The Destroyer as kids. We also appreciated the little spurt of blood when you killed an enemy! 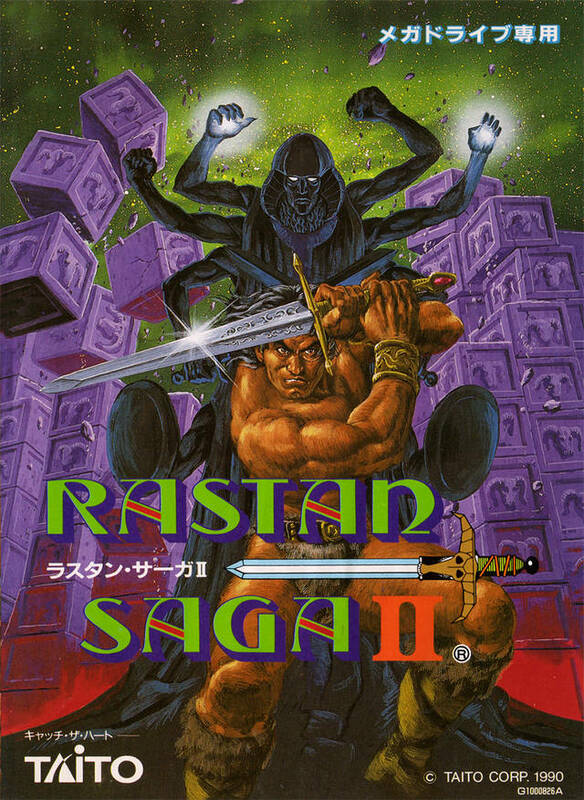 I remember reading about Rastan Saga II in Game Players, I think (more specifically, one of their trade paperback style collections), but I don’t ever remember seeing the game in EB/Babbages/Software Etc. (the game shop loop at the Danbury Fair Mall in Danbury, CT) and have never played it. Funny how that works sometimes; save for EA Sports games we rarely had sequels to games! 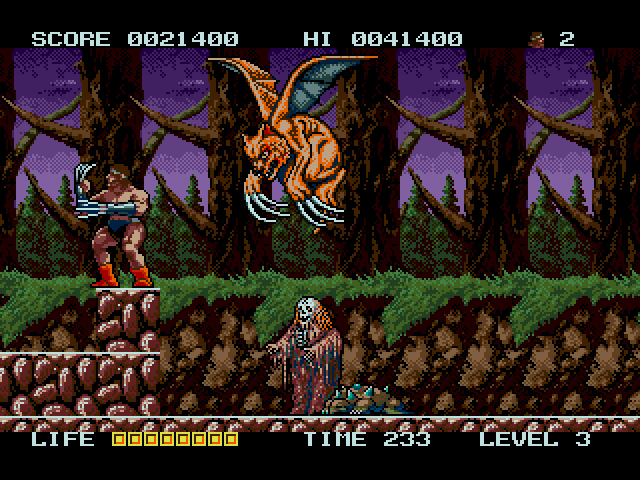 Altered Beast feels like a better reference point for Rastan Saga II than the original Rastan is. Not so much in the transforming, but in the slow pacing and generic, cheesy beat-em-up action. I remember pumping quite a few quarters into Nastar Warrior at a local bowling alley as a kid, and despite the insane arcade difficulty, I remember enjoying it, particularly the creature feature enemy designs, as you say. I also remember liking the music a bit, though in hindsight, and in playing via the Taito Legends 2 port, I realize that it was pretty generic. Going back to the arcade version of this game after all these years, I wonder what I was thinking – it’s pretty much crap. 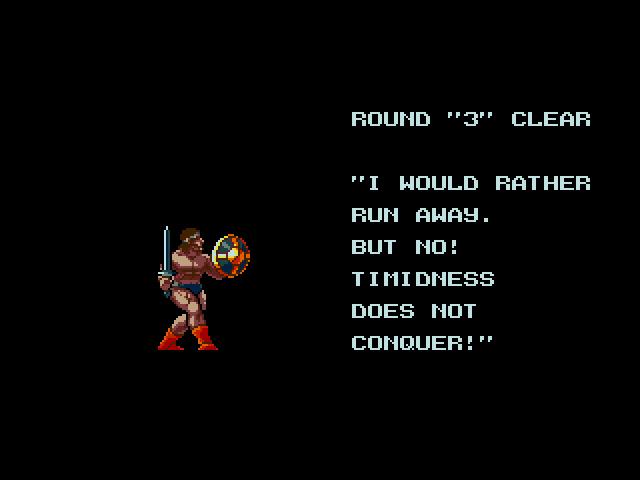 If Taito was looking to design a quarter-muncher, they succeeded, because the dodgy hit detection, gigantic character sprite, unavoidable hits in some places, and boss fights against much faster foes than poor Rastan can keep up with. Also, even though I was only 12 or 13 at the time, I somehow instinctively knew that this was a sequel to Rastan, and even sniffed out the whole Rastan/Nastar thing without having to be told about it. In any event, I’ve never played the Genesis version, but if it’s as maddeningly difficult and unforgiving as the arcade version, then no thank you. If Taito brought back the Rastan series and offered us a good game, I would give it consideration, but this game can go straight back to the early 80’s barbarian B-movie trope hell from whence it came. Something about this reminds me of Swordmaster on the NES. It looks like this has some nice sprite designs, but the weird pixelated cell shading makes it all look very cut price. Swordmaster is a good point of comparison. And they’re similar on the quality, as well. I remember being super sad when I purchased this game. I had the MS original and loved it. When I put this in and found out it was just a slow side scrolling action game with bad animation I immediately regretted my purchase. I ended up playing the arcade version in MAME a few years ago and liked it much better this the Genesis version. I probably would have liked it more if I had not expected and direct sequel to the original MS game. But I am glad you liked it at least. I’m beginning to realize that I like weird things. Everybody hates this game, but it has this weird sweaty charm that I can’t deny.